Nazareth Housing & TD Bank partnered for the Bring Change Campaign, raising $2,335 towards homelessness prevention programs at Nazareth Housing. 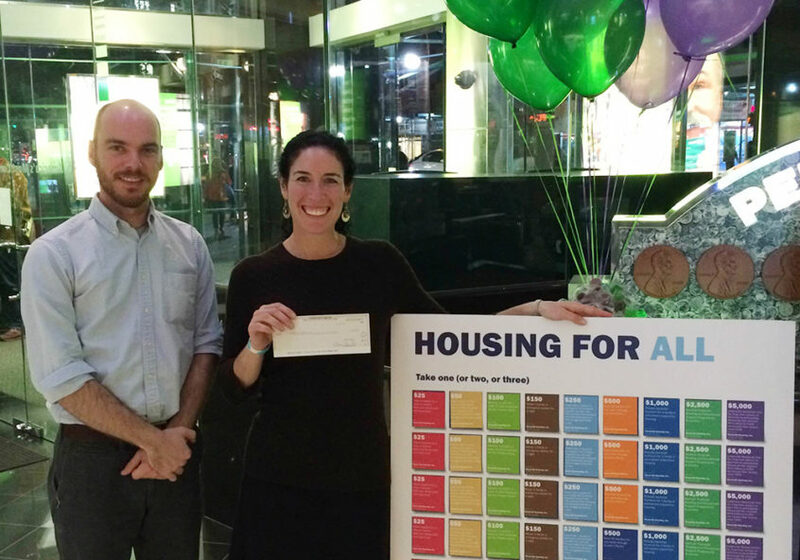 The campaign, held on Friday November 20, 2015 at TD Bank East Village (47 3rd Ave), encouraged community members to convert their loose change into paper bills, the value of which TD Bank matched in a donation to Nazareth Housing’s Housing Stability Support Project (HSSP). HSSP provides ongoing social service support to low-income households and seniors to promote housing retention and continued self-sufficiency. This program is critical to Nazareth Housing which assisted 7,722 individuals in Fiscal Year 2015. Nazareth Housing’s HSSP meets the needs of a growing number of households facing the loss of their housing but not yet in need of emergency shelter—addressing underlying causes before crisis ensues. HSSP offers housing retention and economic empowerment through extensive HUD-certified housing counseling, needs assessment, intensive case management, emergency assistance for rent and utility arrears, connectivity to benefits and rental subsidies, financial security counseling, and skill-building workshops. TD Bank, America’s Most Convenient Bank, is one of the 10 largest banks in the U.S., providing more than 8 million customers with a full range of retail, small business and commercial banking products and services at approximately 1,300 convenient locations throughout the Northeast, Mid-Atlantic, Metro D.C., the Carolinas and Florida. In addition, TD Bank and its subsidiaries offer customized private banking and wealth management services through TD Wealth®, and vehicle financing and dealer commercial services through TD Auto Finance. To learn more, visit www.tdbank.com. Find TD Bank on Facebook at www.facebook.com/TDBank and on Twitter at www.twitter.com/TDBank_US. Nazareth Housing was incorporated in 1983 under the leadership of founder Sr. Marion Agnes Daniel’s innovative spirit to reclaim safe and secure housing in the Lower East Side. More than thirty years later, Nazareth Housing continues to deliver social impact by providing critically needed supportive and low-income housing, homelessness prevention services, urgent needs assistance, and emergency family shelter. Since 2006, nearly 21,000 unduplicated households have been engaged in these critically needed programs. A 501(c)(3) not-for-profit, non-sectarian organization, Nazareth Housing is a HUD certified housing counseling agency, and the only HUD certified agency in New York City that works exclusively with low-income and fair housing rental issues. For more information, visit www.nazarethhousingnyc.org.